Reykjanesbær, was at one time a fishing town, now there is more emphasis on industry, services connected to the airport and the commercial harbor at Helguvík, and harnessing energy and natural resources on the Reykjanes peninsula. The Duusverslun and Fischersverslun storefronts form the old commercial centre of the town, while the docks in front of them were previously the heart of Keflavík. According the Herdís Egilsdóttir’s story about Sigga and the mountain ogress, Grófin marina is where the ogress slept in a small cave, and you can visti her cave and see Sigga. At the marina you can also see Baldur KE 97 or "the Golden Nugget" (1961), which was the first Icelandic boat to use stern tow. There are numerous museums in Reykjanesbærs f.ex. 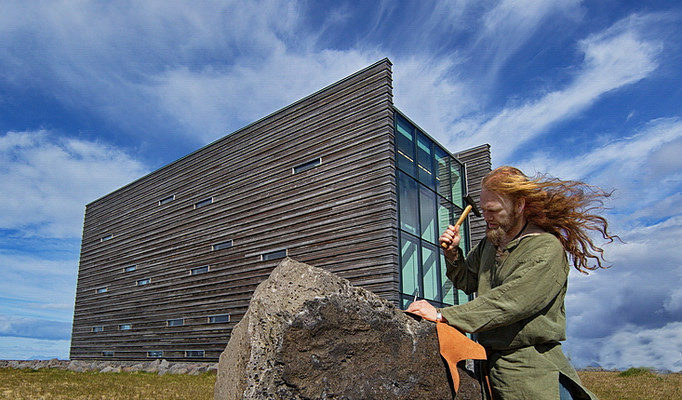 The Viking ship Icelander and Viking exhibition, the Hljómahöllin music centre, and the Duushús Cultural Centre in Reykjanesbær, which houses the Reykjanes Art Museum, the Grímur Karlsson Boat Museum, exhibitions for the Reykjavík Heritage Museum. Public art is displayed through the town, including a memorial to fishermen lost at sea by Ásmundur Sveinsson, and a memorial to legendary sailor Stjáni blái by Erlingur Jónsson. Ljósanótt (or "The Night of Lights"), an annual cultural festival for families, is held at the beginning of September.